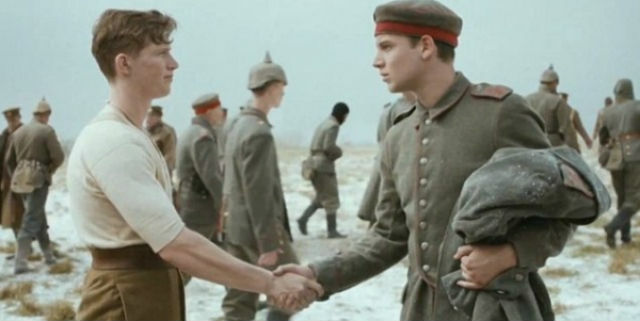 Sainsbury’s decision to use the story of the Christmas Truce to drive their 2014 seasonal advertising campaign provoked debate about the ethical and moral issues regarding advertising and war, but also served to bring the story of the Truce to the front of many peoples’ minds. Shortly after the advert was first shown in the UK, a cancelled Geography fieldtrip led to Year 9 students returning to their ‘normal’ lessons without their usual classroom equipment or books. 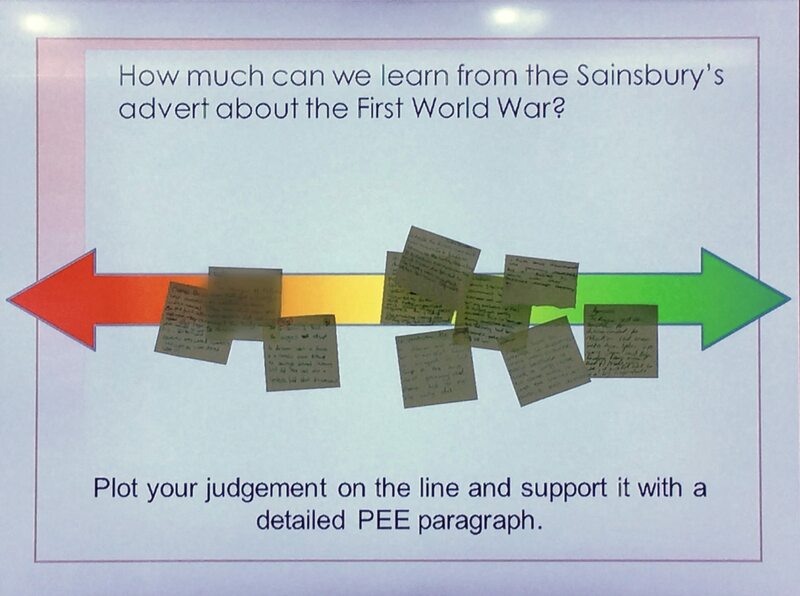 I therefore chose to seize upon their interest in the Sainsbury’s advert and the story it tells to teach an impromptu lesson in which the students were asked to evaluate the advert as an historical source. This post attempts to give an overview of the lesson I taught, and the responses from my students. A hundred years on, the Christmas Truce has become mythologised to such an extent that the stories peddled by some are dangerously misleading. Although I’m a big fan of Horrible Histories, for example, their sketch based on the Christmas Truce focuses almost exclusively on the legend of the football match. They do make some good references to the wider context of the war but, for a TV show that (usually) presents well-researched and accurate history, the clip below is a concern due to its emphasis on football at the expense of everything else. Such popular histories can mean that when people think of ‘the Christmas Truce’ they imagine the entire Western Front downing arms and having a huge kick about in the middle of No Man’s Land. This isn’t true of everyone, but UEFA’s recent series of Remembrance events has further reinforced the stereotype. My students’ subconscious ‘knowledge’ of this was awakened by the new Sainsbury’s advert, and I was keen to think of a way to address the reality of this interpretation with my classes. I began by simply showing the advert in its entirety, and asked the students to share their initial thoughts. What does it tell us about the First World War? What does it not tell us about the First World War? The first two questions were designed to get students thinking about the provenance of the source, which I hoped would feed in to their answers to the next two questions about the content. The most obvious thing they picked up on was the football match shown in the advert. However, they also commented that the advert can be used to tell us what the soldiers wore and how they passed their time in the trenches, One student also pointed out that the portrayal of the trenches matched with what they’d already learned about trench construction in a previous lesson. In terms of the counter argument a student highlighted that, although the advert focuses on a truce, it doesn’t really tell us how common it was for troops to lay down their arms. This point was developed by another who commented that the explosion that sends the two sides back to their trenches shows that the fighting continued elsewhere, even though the section of the line in the advert held a truce. They were beginning to grasp that idea that one specific event does not prove the presence of a wider trend. I then showed the students the ‘making of’ video, and the ‘story behind the advert’ video, both of which provided them with more contextual information. Many noted that the ‘story behind the advert’ video clearly states that the events are fictional, but that the makers say they tried to be as accurate as possible. 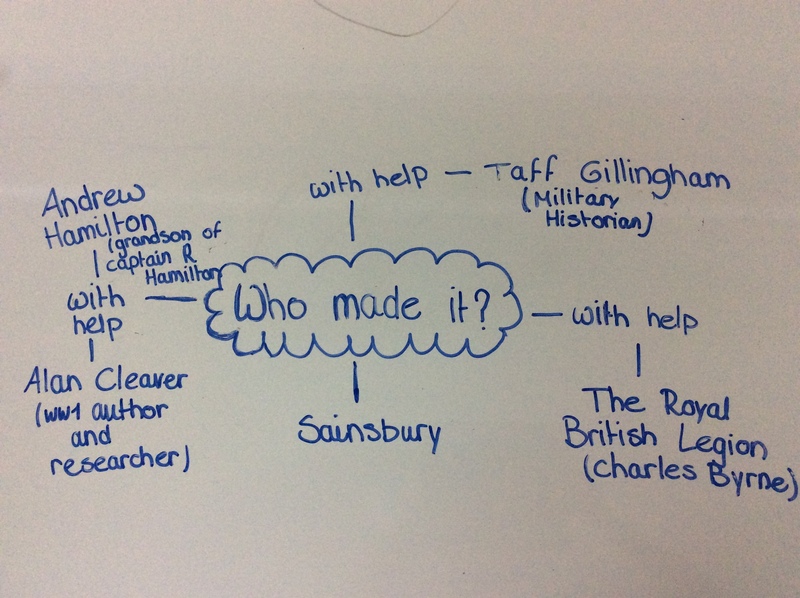 After viewing these videos, students were given a few minutes to return to their group discussions, in which they began adding details about the origin and purpose of the film related to the ‘who’ and ‘why’ questions they had originally been set. In particular, they found it important to note the involvement of the British Legion, and the presence of an historical consultant to ensure accuracy. It was at this point in the lesson that students began to realise that the advert was therefore an interpretation of the Truce, based on the different aims of those involved in its production. To help them further explore this idea, I distributed two more sources of information. Half the groups received a series of extracts from the Twitter feed of Taff Gillingham (https://twitter.com/Taff_Gillingham), the historical consultant on the advert. The other groups were given the joint press release by the British Legion and Sainsbury’s. 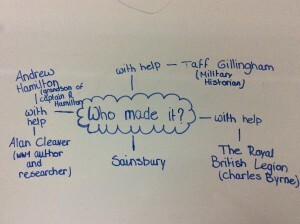 The students were asked to read and annotate these additional sources. Those with the Twitter feed were able to learn about Gillingham’s own background, and noted that he is a respected commentator on the Christmas Truce. One group highlighted the section where he tells of how he and the director didn’t want football to dominate the advert, but that “the client” (i.e. Sainsbury’s) wanted to ‘push the football hard’. They also found it helpful to read the section where he outlines his own process of historical research to find corroborating evidence of a football match taking place. Meanwhile the groups with the press release highlighted that the advert is referred to as ‘a creative interpretation’ although they ‘sought to make the portrayal of the truce as accurate as possible’. Many also highlighted the charitable element of the advert. Depending on time you may also wish to include additional sources. The Football Remembers source pack includes some good materials. I’ve had most success with Source 9 (which is actually one of the sources used by Taff Gillingham used when advising Sainsbury’s), Source 32, and Source 48. Since first teaching this lesson, a previously unpublished letter has come to light which could be a great additional source. Most sources are from lower ranking soldiers, but this is from General Walter Congreve who was awarded the Victoria Cross. It’s particularly interesting because the majority of accounts of the Truce say that senior officers were opposed to the Truce, whereas Gen Congreve’s letter seems quite supportive of it – if only for tactical reasons. The Daily Telegraph published a full transcript of the letter on their website, though the headline ‘The real story behind the 1914 Christmas Truce’ is to be taken wit ha pinch of salt! It can also be interesting to contrast the portrayal of the war in the Sainsbury’s advert with that in Private Peaceful, which is taught in many Y7 English classrooms. Although Private Peaceful does not address the Truce, it offers an almost-entirely opposing interpretation of the war in general and can provide a good stimulus for a discussion of audience. Students with different sources then paired off to share their new-found insights with each other. This led to some interesting debate, with one pair commenting that the purpose of the historical account – i.e. Sainsbury’s desire to advertise their product – meant that some of the nuanced history from Gillingham’s research was lost. This final piece of paired work also enabled students to discuss the overall lesson question to reach a conclusion about how much the advert can teach us about the First World War. Using a technique shared by Patrick O’Shaughnessy on Twitter (https://twitter.com/historychappy), students then recorded their opinions on Post-It notes which they stuck to the board to form a continuum. These views were discussed as a plenary activity. Since first teaching this lesson five days ago, it is clear that many of the students have watched the advert again. They have found yet more historical references in the advert, some of which I’m sure they will have been looking for after reading Gillingham’s tweets. Although I recognise that there is an important debate to be had about Sainsbury’s decision to produce this advert, I believe that we have the opportunity to use it as a springboard to address the real history of the Christmas Truce and correct the myths and legends that overshadow the reality of life on the Western Front at the end of 1914. It is really encouraging to see a great history lesson coming out of the advert! Many thanks for taking the time to comment. I’m glad you found the lesson outline interesting / useful!